A pest infestation can be one of the most bothersome issues to confront a homeowner. Concerns regarding the danger of disease coupled with the cost and time involved in complete eradication of the pests can be a nightmare. Infestations of bed bugs are becoming an increasingly common phenomenon, particularly in urban areas. While the small insects are not known to transmit disease, their effects can be unpleasant. 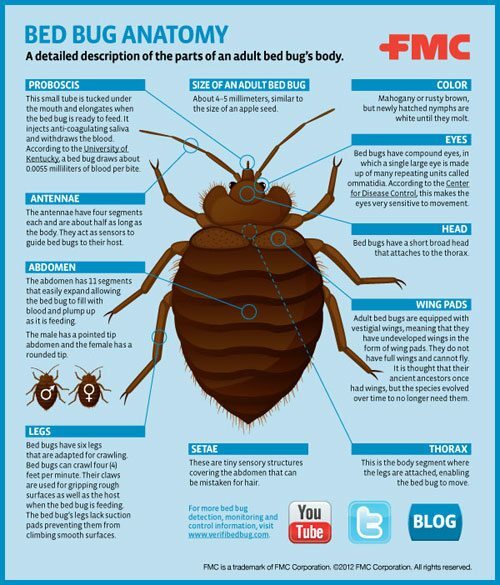 When buying a home, it is important to know about the presence of past or current bed bug infestations. Current homeowners should take precautions to reduce the chances of a pest invasion. While most people have at least heard of bedbugs, many do not know what they actually are. Bed bugs are small reddish brown insects that feed on blood. They are similar to a wood tick in appearance and often only come out of their hiding places at night when there is little activity in the house. They feed quickly and usually remain undetected by sleeping humans. Although they do not transmit disease, they can leave a red bump or rash on a person’s skin and their rust colored droppings create stains on clothing and furniture. When buying a home, finding out about infestations should be on the buyer’s list of things to do. The first place to look for this information is on the property disclosure form. Many forms include infestations as a category about which the original homeowner must provide knowledge or history. If this is not present, the buyer should take the initiative to ask the seller. While pest infestations may be an embarrassing or unpleasant topic, it is imperative that a buyer know about any infestations that have occurred in the past. In some cases, the seller may be reticent to provide information about bedbugs or may not be entirely honest. If this happens, a buyer who knows how to recognize signs of infestation may be able to discover the presence of bed bugs by looking for telltale signals. Small, rust colored feces that are present in corners of rooms are a sure indication of this pest. Individuals can also look for empty shell casings that young bedbugs discard as they grow larger. Since bed bugs most often invade bedrooms, search for these signs around and underneath beds and, if possible, behind bedroom furniture. While this preliminary inspection is not an absolute authority, it can often be enough to at least indicate the presence of a current infestation. As a person comes to a point when they are seriously interested in purchasing a home, it would be wise to conduct a professional home inspection. Choose a professional home inspector or a more specialized professional who is especially trained in recognizing and dealing with pests. Because bedbugs are able to hide in extremely cramped and unexpected locations, a thorough home inspection can include furniture disassemble, investigation of electric outlets or careful searching in minute cracks. The cost of the inspection is a worthwhile investment for buyers who want to purchase a pest-free home. Discovering the problem now can save the trouble of a bigger infestation later. If the home has bedbugs and the buyer still wishes to purchase it, professional pest eradication is recommended. Because the chemicals used to eliminate insect infestations can be poisonous, it is safer and more effective to acquire the services of a professional. While this may be more expensive than do it yourself remedies, it will ultimately save money and time as less expensive fixes may not completely wipe out the insects and the homeowner will have to deal with subsequent or stronger infestations. Taking steps to ensure that a home is free of bed bugs before moving into it can keep these pests from spoiling the excitement of owning a house. Bedbugs can be a headache for any homeowner. The uncomfortable bites and filthy excrement left by the creatures can be a frustrating dilemma to address. Buyers who ask questions, know how to recognize the signs of bedbugs and deal with infestations quickly and thoroughly are able to avoid the nightmare that these pests can become. Responsible Pest Control Mesa AZ – Serving Happy Customers in: Phoenix, Mesa, Gilbert, Scottsdale, Chandler, Glendale, Queen Creek, Maricopa, & surrounding Cities.